Bark is the outer part of stems, branches and roots in woody plants, which surrounds wood and makes up 10–15 % of the plant’s weight. Bark can be obtained from wood processing in paper pulping and fiberboard factories. Recently, the utilization of Acacia mangium bark has been subjected to the production of tannin, an adhesive for wood composites. Unfortunately, usage of tannin as adhesives is still very rare and most of the bark obtained in those industry have been disposed as waste. Production of molded products using renewable resources such as wood, bark and plant fibers may become important to reduce the utilization of unrenewable resources from fossils such as coal and crude oil. 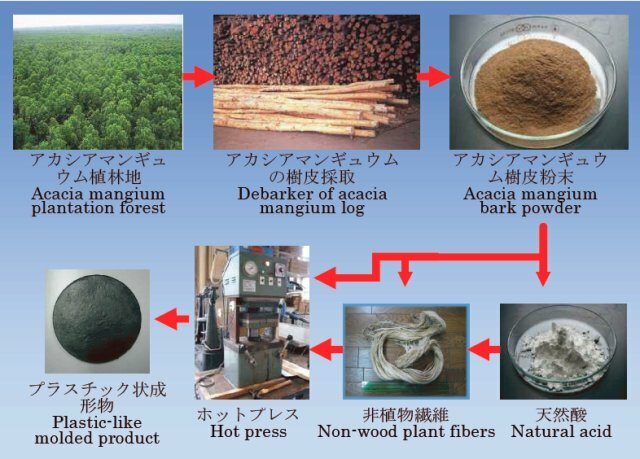 In this study, acacia mangium bark, natural acid (citric acid) and plant fiber (sansevieria) are exploited to search the possibility of fabricating materials to molded products. Four kinds of molded products made from (1) acacia bark, (2) acacia bark and sansevieria fiber, (3) acacia bark and citric acid, and (4) acacia bark, sansevieria fiber and citric acid with various pressing conditions (temperatures : 140–280 °C, pressure : 4–12 MPa, time : 5–20 minutes) are produced. In this attempt,the best physical products were obtained at processing condition of 260–280 °C for acacia bark molded, 200–280 °C for acacia bark-citric acid molded. The lowest value of weight decrease of molded products after 4 hr boiling test was 2 % that was produced above 260 °C. The mechanical (bending), morphological and thermal properties of materials and products will be discussed in detail.